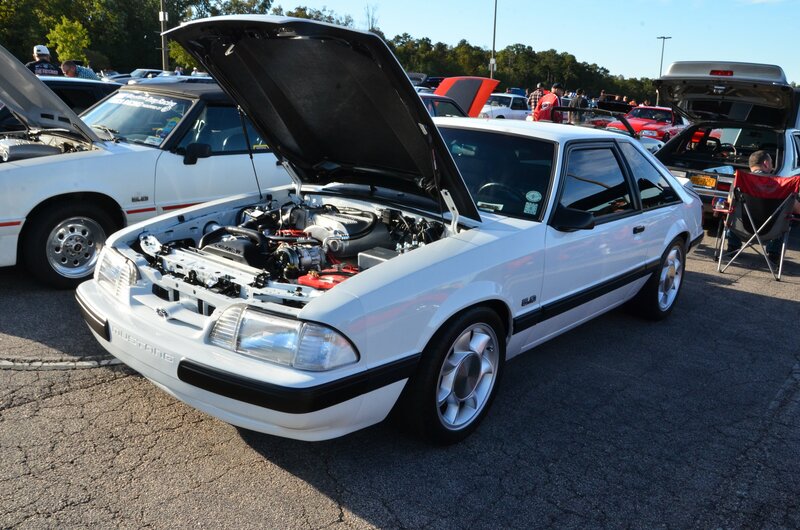 Foxtoberfest is a once a year gathering of Fox Mustang and Fox Chassis Ford and Mercury vehicles that started out as a small monthly club meet and has since grown over the span of eight years to what is now Mecca for all Fox owners and lovers alike. Hosted by Matt and Jenn Highley, owners of Fox Mustang Restoration in Locust, North Carolina with the volunteer help of the Southeastern Foxbodies Mustang Club, the event started as the October club meet for Southeastern Foxbodies at Matt and Jenn’s headquarters in Locust. It then quickly outgrew a second facility and moved to the even larger Intimidators Baseball Stadium in Kannapolis, North Carolina where the event has been held for the past few years. 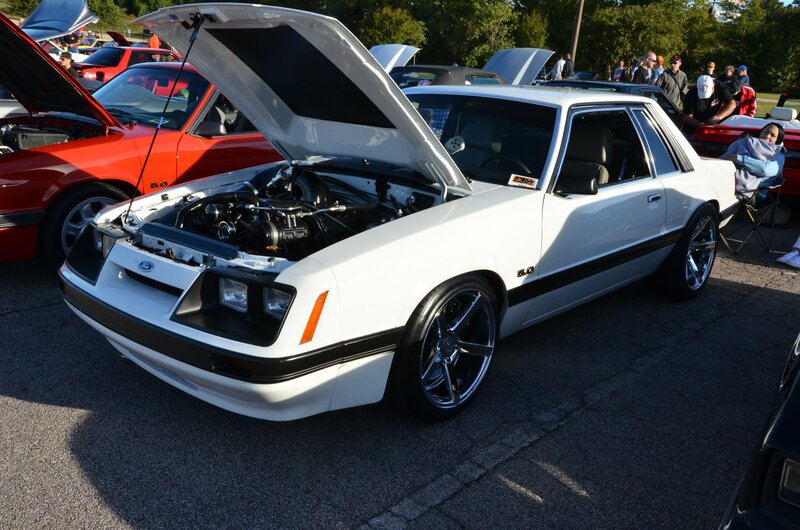 Annually, the event draws somewhere between 500-600 Fox Mustangs as well as Fox chassis cars such as the ’80s Thunderbird, Fairmont, LTD, Capri, and more. We are still awaiting the official car count for 2018, but we are told it was right on track with somewhere around 500 cars coming out for the event. As you would expect, with 500 cars in attendance, there were some seriously nice Fox bodies – making our Top Ten list very hard to pick! However, after several laps around the show field, we finally picked out our ten favorites. Check them out below! Also be sure and check out our huge gallery of all the Fox bodies in attendance at the bottom of our list! Jason Smith’s 1982 Mustang GT is one of the cleanest, unmolested examples of a Fox Mustang you will find anywhere around. In fact, the car took home “Best Original 1979-1986” at the event. Jason bought the car from the original owner back in 2008, making him of course the second owner of this beauty. Jason admits the tires and TRX wheels are a bit newer version for safety purposes, but that the originals are still in storage if the need arises. This is one beautiful time capsule Fox! Great job Mr. Smith at preserving this piece of Mustang history! Jason Smith first saw his "dream fox" back in 1987 as a teenager when it belonged to its original owner, his boss at the time. As any teenager would, Jason told his boss he wanted to buy the car when he got ready to sell it. A little over 20 years later, Jason finally got the chance to buy the car and immediately hitched up the trailer and headed after it, we cannot blame him one bit! One of the cool things about Foxtoberfest is the wide variety of cars you see there. From show winners to restoration projects and everything in between. The show has always had open arms to Fox bodies that are a little less than perfect. After all, that is the idea behind Matt and Jenn’s business, promoting the restoration of Fox bodies. They even give out awards for cars “Most In Need Of Interior” and “Most In Need Of A Convertible Top.” So it should go without saying that we had to include one “less than perfect” Fox in our top ten list. That car is this super cool black four-eyed coupe. While its paint and interior show a little bit of age, the key parts of this car are right on the money. Under the hood is a 3-valve 4.6-liter swap, which by the way, we think is very underrated and not done nearly enough in these cars. The 3 Valve motors have proven to be basically bullet proof and very reliable, not to mention readily available. Making them the perfect engine to pick up at a reasonable price and have a lot of fun with! Fun is exactly what we would like to have with this coupe! Simply drive it and enjoy it! 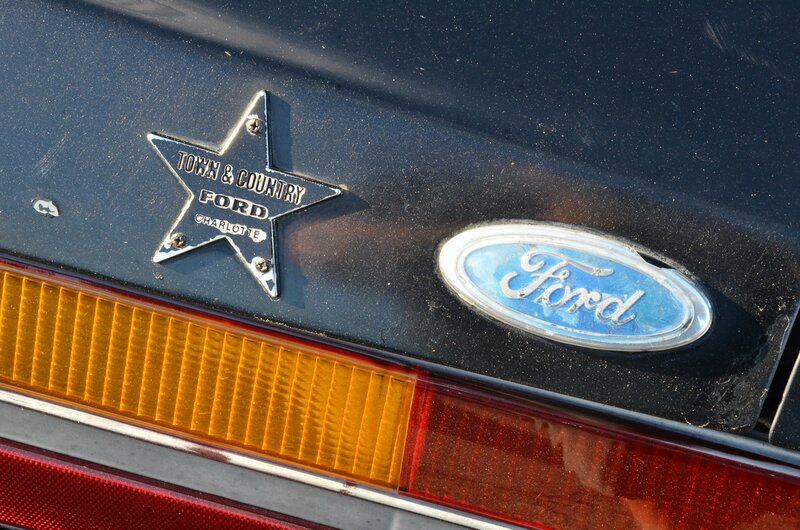 While the 3-valve swap is cool, the old school original "Town and Country Ford" star is really the coolest feature on this coupe! SSP(Special Service Package) Mustangs are always a treat any time you see one out at a show. This year Foxtoberfest featured both a marked Georgia and North Carolina car. Of course, being the show is in North Carolina, we had to feature this one! Unless you have been living under a rock for the past few years you have probably seen Jamie Marsh’s ultra cool Roush Tribute Mustang at a show around the south. 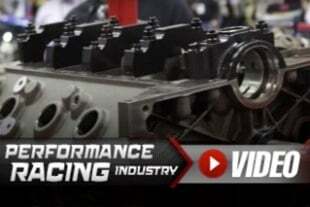 Jamie took an ultra-rare Roush intake manifold and built the car around it as if Roush would have made modified a Foxbody from the factory for the public. Jamie did such a cool job on it that the Cat In The Hat, Mr. Roush himself signed off on the car last year at a Roush event in Detroit! 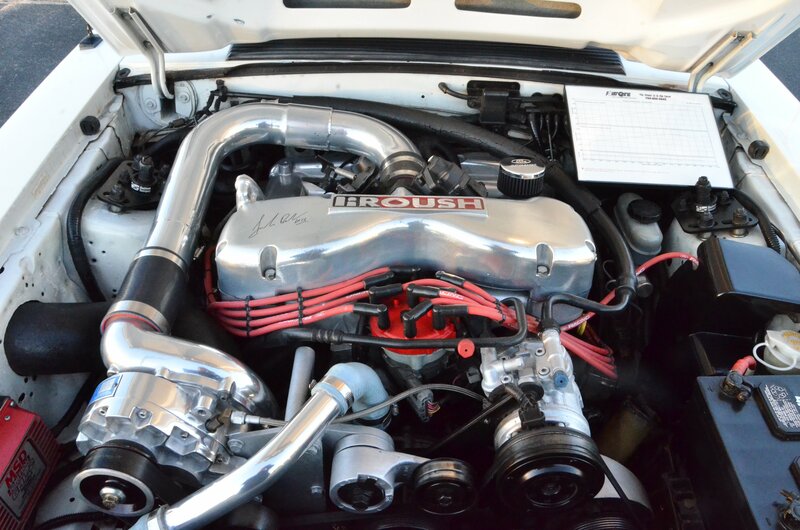 This Roush intake is serial number seven out of about 100 produced. Most of them made their way to 1994 and 1995 Roush-modified Mustangs. Jamie was lucky enough to come across this one at a swap meet a few years back in near perfect condition! If you’re a Fox Mustang fan, chances are you have heard of The Foxcast and Caleb Richards. 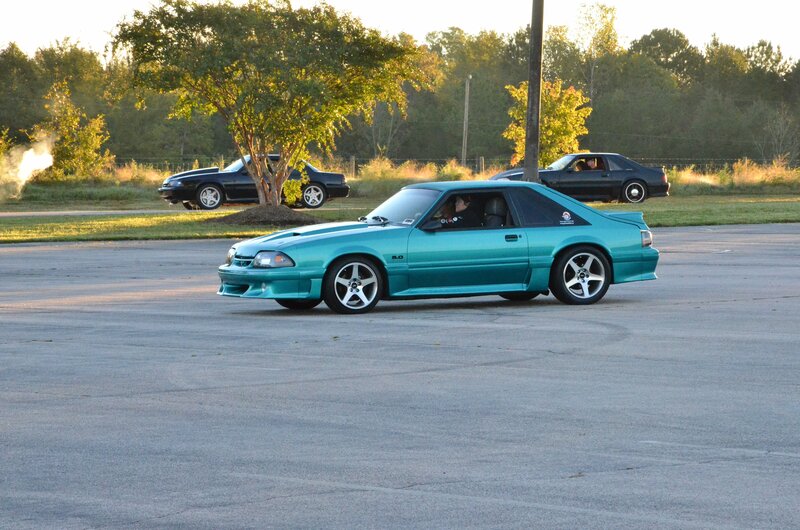 Foxtoberfest was the big debut for Caleb’s “Project Road Warrior” and its new Coyote swap. While Caleb admits there are still a few bugs to work out, the car certainly looks sinister with its drag wheel set up on it. Before we jump into our Top Five, lets take a look at a few Foxes that just barley missed the cut! A rare "Predator," a super clean and nicely modified 1993 Cobra, a Georgia SSP coupe, and a rare Canadian Dech coupe. This blue 1989 GT has to be one of the most uniquely optioned cars we have come across in a while. Not only that, the car is super original from one end to the other! Ordered with no AC or power windows, but with a GT body kit makes this an odd one for sure! 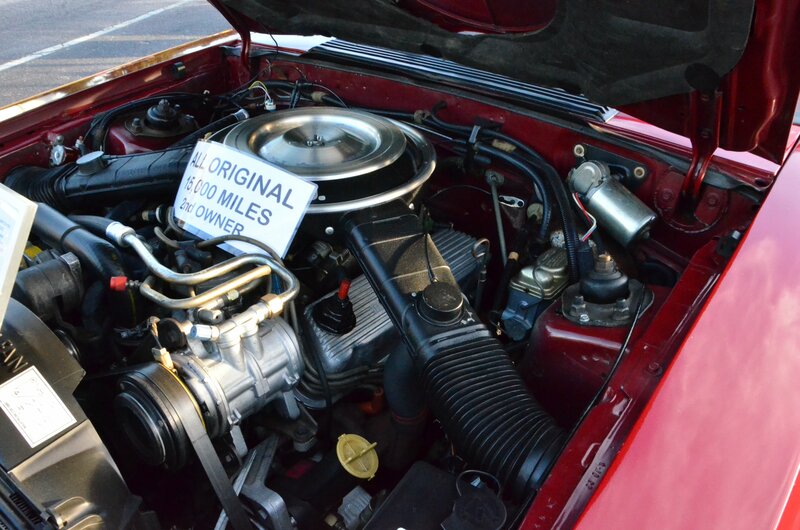 The great thing about these Mustangs is with the availability of the Marti Report, we can confirm all the options or lack there of – as with this no air conditioning, no power window GT. Obviously whoever ordered this one and some very specific intentions for it, racing perhaps? Or maybe they liked the GT body kit but where on a budget otherwise? Whatever the reason, it makes for one cool Fox almost thirty years later! One of the cool features about Foxtoberfest is the fact that it is open not only to Fox Mustangs but other cars that share the Fox Chassis including this cool late 80’s Lincoln! This car also features several other Mustang friendly parts and pieces like a classic set of drag lights, Marchal Fog Lights, and a Hurst shifter. Yeah, that is right, its a manual transmission car! Super cool! Here is what we know about this Pro Street Capri. It’s super old school, super wicked looking and has a huge Ford powerplant shoved under the hood! That was enough to drive it all the way to number three on our list! We will be the first to admit, before Foxtoberfest we were not too educated on the “Dech Mustang.” These Canadian-built Mustangs are definitely a unique creature and very cool to look at. This hatch, as well as a silver coupe, were well representing the Dech heritage and brand at Foxtoberfest! Very unique and very '80s cool. The Dech is a piece of Fox Mustang history that should be well preserved and hopefully not forgotten in the future! These cars featured many suspension upgrades from the factory as well as a wind tunnel tested body kit for maximum aerodynamics. What is cooler than a 1993 Cobra R? Well, a race prepped 1993 Cobra R of course! This car was race prepped by Pro-Prep Motorsports of Cadillac, Michigan and made its debut on the race track with just 33 miles on the odometer. The R competed in a very successful 1994 season in the SCCA Central Division American Sedan Regional Championship, taking home second overall in points before retiring from competition at seasons end. This car holds the distinct honor of being winning the first recorded road race win of any 1993 Cobra R. Today, the car is preserved as it was and still looks ready to go take on the curves at a moments notice!